NEWCASTLE is Australia's most underrated city, but if you have taken the time to pull in off the Pacific Hwy, you would know why it was named in the Lonely Planet's top 10 cities for 2011. There are many reasons why people fall in love with this New South Wales seaside city - from its rich history and convict past to the shipping graveyard of the harbour. Or it may be the long stretches of pristine white-sand beaches or the vast and beautiful Lake Macquarie, which is Australia's largest coastal saltwater lake. Whatever the reason, once you have visited this coastal city, it will no doubt hold a special place in your heart. My love for Newcastle stems from the fact I was born there, but my adoration for this city comes after years of getting to know it better. Every year for 19 years, I have returned to Newcastle to catch up with all the relatives but it was not until this year that I took the time to truly explore "Newy" (as we locals call it). My sister Melanie and I went on a mini-road trip around the metropolis, checking out the entertainment, beaches, art galleries, coastal walks, drinking-holes and picnic spots. Our favourite place to visit was King Edward Park. The park has an elegant rotunda, playground for the kids, tranquil rose garden and breathtaking views of the ocean. On weekends, the park resembles a patched-up quilt with randomly thrown picnic blankets covering the grassy expanse, stitched together by families criss-crossing the park with frisbees, weaving in and out of the trees and climbing through the rotunda. But if you have a passion for good food and shopping, then Darby Street is an absolute must. Grab a friend, do breakfast and catch up at one of the 20 cafes on the Cooks Hill road. After a spot of shopping, you'll find nothing better than heading to the popular Canoe Pool. The Newcastle Ocean Baths are great for those people wanting to take advantage of the calmer conditions without having to sacrifice the ocean views and laid-back atmosphere. The only missing ingredient is fish and chips, Novocastrian-style. Perhaps the most popular fish and chip shop in Newcastle, Scottie's, is in Newcastle East, just a short walk from Nobbys and Newcastle Beach. Pick up some takeaway, head down to the beach and enjoy your goodies as the salty sea breeze passes over you. Of all the incredible sights in Newcastle, top of the list and one of its defining features is its busy harbour port. Newcastle is the biggest exporter of coal in the world. Take a moment to sit and watch the port in action and be amazed as giant 300m freighters, almost close enough to touch, are guided into the harbour by comparatively tiny tugs. Sharing the harbour with coal ships are freighters, fishing boats, ferries and private vessels, making for a chaotic but exciting scene. By night, the harbour glitters and by stealth, freight ships suddenly appear out of the darkness, occasionally catching you out with their unexpected horns that can be heard from as far away as Merewether. Dine at one of the restaurants at Honeysuckle and enjoy front-row views of all the action. Newcastle may fly under the radar of Aussies and international travellers, partly because it's overshadowed by its bigger, bolder and better-known sibling, Sydney, 150km to the south. But Newcastle has more than enough to keep visitors entertained. Australia's second-oldest city is not only ideally located just two hours by road or rail or 30 minutes by plane or seaplane from Sydney, it's also less than an hour's drive to the Hunter Valley wineries to the west. To the south is sailboat-filled Lake Macquarie. 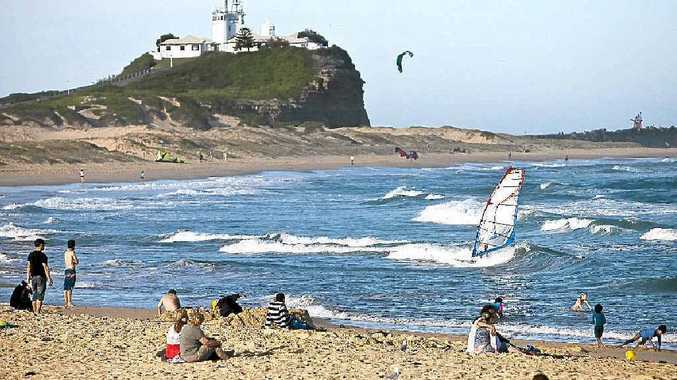 Head north to the whale-watching and shark-feeding paradise of Port Stephens and to sandboarding at Stockton Beach (the southern end of the 32km-long beach is a five-minute ferry ride across Newcastle's harbour). Visit www.visitnewcastle.com.au for more holiday options.